The Royal Exchange of Sydney can trace its origins back to the 1820’s where several attempts were made to form an exchange to facilitate business and commerce in New South Wales. However, it was not until 1851 that The Royal Exchange Company was finally formed with the aim of providing a place of meeting for the commercial community. Founded by Act of Parliament in 1851, The Royal Exchange is one of the oldest and most prestigious institutions in New South Wales. A grant of land was obtained on Gresham Street, opposite Macquarie Place, and in 1853 plans were commenced for the construction of a permanent building. The design of J F Hilly, a well-known Sydney architect, was selected. 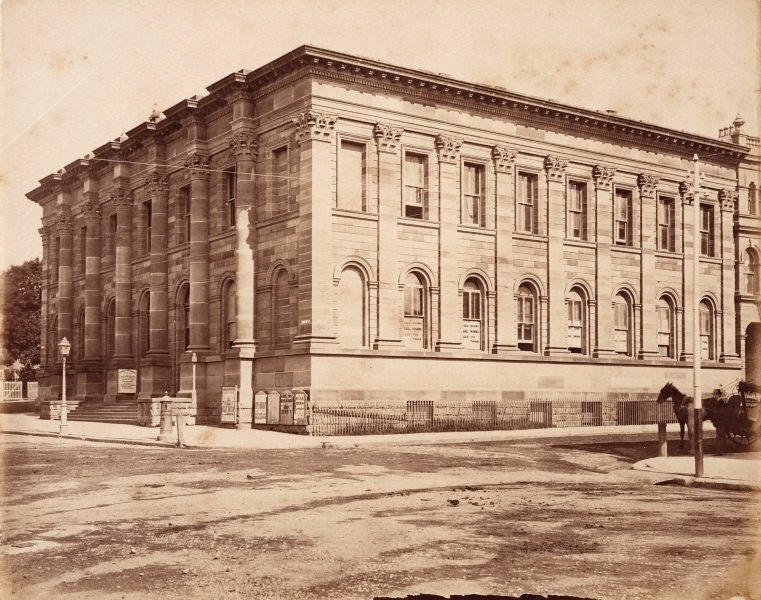 4,000 of NSW’s 50,000 population watched as Governor - General, Sir Charles Fitzroy, laid the foundation stone of the new building on 25th August. This new sandstone building was four storeys high and designed in the Corinthian manner. It became a symbol of Sydney’'s prosperity in the 1850’'s in the gold rush era. By 1857 the building was completed and was officially opened by the then Governor General, Sir William Denison, on the 30th October 1857. The first telegraphic message in New South Wales was sent from the Exchange to Liverpool on the day of the official opening in 1857 and within a week a telegraphic line was installed linking the Exchange with the South Head Signal Station. A Grand Ball followed the opening ceremony and 600 ladies and gentlemen celebrated until the early hours of the following morning. The Royal Exchange met with enthusiastic support and the membership roll included many of the leading citizens of Sydney such as Thomas Holt Jnr, John Fairfax, David Jones, T S Mort, Robert Tooth and W C Wentworth. Over the ensuing years The Royal Exchange was associated with some of the most interesting organisations and events in New South Wales. The Sydney Wool Exchange, The Fire Underwriters Association, The Coal Association and The Royal Humane Society of New South Wales can all trace their beginnings to the grand old building at 56 Pitt Street. The chamber of Commerce, founded in 1824, also took up residence in the new Exchange Building. The Exchange became the centre of commercial activity for the emerging capital and operated as stated in its charter with the objective of ‘‘furthering commerce for the benefit of future citizens of Sydney’’. The first telephone system in New South Wales was established by The Royal Exchange in 1880 with the connection of the Darling Harbour Woolsheds with the Exchange. Within weeks a number of wharves were connected, and many businesses became interested in the new system culminating in 300 subscribers by 1882. The Captains of the great Clipper ships traded their cargoes and transacted business from the floorboards of The Exchange. The skippers of such famous ships as the Cutty Shark, Thermopylae, La Hogue and Brilliant were such frequent visitors that The Exchange affectionately became known as the ‘‘Albatross Club’’. The share-brokers moved in in 1871 and the Sydney Stock Exchange was born. In 1872, there were 10 share brokers operating. Three years later there were 24. Membership flourished during the Broken Hill boom of 1888 when fortunes were won and lost. By 1896 The Stock Exchange had grown so big it was forced to move to bigger premises at Martin Place. Perhaps the most prominent activity that people associate with The Royal Exchange is wool auctioning. For 100 years, from 1864 to 1964, auction sales of wool were held at The Exchange. It became the world&#39;s biggest wool selling centre. At first sales were irregular, and in small quantities, but in time it became the world’s greatest wool selling centre. Another milestone for the Exchange was the first public demonstration of electric lighting on the 6th December 1882, when the Dining room was lit up by electric light. It would be another 44 years before the Members Room was converted to electric light. This may well have had something to do with the Chairman of the Gaslight Company also being the Chairman of The Royal Exchange. On 31 st December 1900, the evening of the inauguration of the Commonwealth of Australia, the statue of ‘‘Commerce’’, designed by sculptor James White who also created the Statue of Liberty, on top of the building was unveiled. It stood there until 1964 when the building was demolished. It has now been given pride of place outside the refurbished building over looking over Pitt Street. In 1901, His Majesty King Edward VII bestowed on The Exchange the new title, The Royal Exchange of Sydney. In 1960 developers acquired shares in the Sydney Exchange Company. In 1964 the developers managed to obtain from the Government a new Act which changed the terms of the original grant of land. However, the Act contained a covenant that 2400 square feet of floor space was to be provided by the owner of the building for the operation of an Exchange. Unfortunately, the demolition of the historic sandstone building ensued and a significant historical Sydney landmark was lost, despite a public outcry. The Royal Exchange today occupies the same location in Gresham Street and has a deserved reputation as one of the premier luncheon venues in Sydney. The club continues its tradition as a place for like minded business people to meet, interact and facilitate the ‘exchange’ of business with one another.